Happy Jim White boxing day everybody. All in all, it was a fairly interesting day of transfers, so he’s a selection of some of the most intriguing. Let me first ask you to read the title again though; these are what I consider to be the most interesting transfers, not the best deals. Oddly, fans of both clubs were declaring the deal good business, and I’m inclined to agree with the Blues on this one. Despite using the exact opposite argument for the signing of Stewart Downing, many Liverpool fans were happy for the Portuguese to leave because he wasn’t world class, so wouldn’t strengthen Chelsea. However, this ignores that, just as Liverpool could have done with a pacey winger, Chelsea were in need of a dynamic midfielder. Effectively, Liverpool have just given Chelsea exactly what they need to improve their unimpressive start to the season for a fee supposedly just Â£1m more than what they paid a year ago. The move also leaves Liverpool without an intelligent and creative midfielder when they had two in Meireles and Alberto Aquilani at the start of the summer. What’s more, despite his tendency to shirk tackles, he was more solid defensively than Steven Gerrard or Charlie Adam. If anything happens to Lucas, Liverpool could have some serious problems in midfield this season. Not a bad transfer by any stretch of the imagination, but not a great one either. Arteta’s a very good player, yet Arsene Wenger’s pretty much just downgraded from one Spanish playmaker to another, injury prone one. At 29, he’s obviously meant as a stop gap and, providing he stays fit, he should perform well, nevertheless it seems to be papering over the cracks of a poor summer from Arsenal. Tricky season ahead. All has not started well for Luis Enrique at Roma. However, should he advance past these early struggles, the future looks bright for the capital club. Fernando Gago and Marco Borrielo also signed on deadline day, joining Bojan Krkic, Maarten Stekelenburg, Gabriel Heinze, Erik Lamela, Pablo Osvaldo, Jose Angel and Simon Kjaer as new arrivals, but the clever Bosnian is probably the highlight of the window for Roma. Having been displaced by Yoann Gourcuff at Lyon, the move to Italy should be a successful one for Pjanic – what makes it interesting is the project around him. More fascinated in learning the contract details of this one to be honest. Have they given him a standard contract or a more appearance-based deal? Doesn’t matter if he stays fit of course, but I don’t see it happening. Good player, bad knees. Bit of a shame he didn’t rejoin Norwich to get a shot in the Premier League, nevertheless he could do worse than a move to Sam Allardyce’s West Ham. Not exactly the classic Arsenal player, Lansbury’s athletic and hard-working yet his passing can be mixed and his forward thinking mentality, while being one of his main benefits, can also lead him into giving the ball away cheaply. A future at his parent club looks a touch unrealistic, so it will be interesting to chart his progress and see if he merits a transfer to a different Premier League side. Pasquale Foggia’s loan to Sampdoria from Lazio fits a similar category, albeit a more depressing one given he’s now 28, as does Luca Cigarini’s return to Atalanta to a lesser extent. Strange boy this one. Emerged at Santos with Robinho and opted to replace Deco at Porto after they won the Champions League with mixed results. Having re-established himself at Werder Bremen, he moved on to Juventus, where he was harshly blamed for the Turin side’s failures. Still he didn’t really fit and was shifted back to Germany for a season at Wolfsburg, who barely avoided relegation, not helped by the Brazilian generally being a bit of an arse. Now in Spain to replace the outgoing Sergio Aguero and Diego Forlan with Falcao, it could go either way. Hyped as the missing puzzle piece for Roy Hodgson’s masterplan by the English media, Cole spent the little time he did have on the pitch looking knackered. Where exactly he was meant to fit in is unclear, but if Christian Purslow had applied logic to his decisions on Merseyside he would have been at least half-competent, wouldn’t he? Thankfully given an escape route by the French champions, it will be interesting to see how he does. The first question to ask is where he will play: although the slower pace of the league should help him, he’s never really had the intelligence to play in his favoured central role, but he also isn’t athletic enough to play the wide role in Lille’s favoured strategy. Could be another long season for him. Mate of mine supports Liverpool, and he was so critical of Meireles last season it was untrue. I couldn’t believe it. Even during his rich vein of form that coincided with Dalglish taking over, my mate was still unwilling to give the player any credit. I tried to convince him that his hatred for Hodgson was blinding him to the obvious quality of the player, but to no avail. Strange man. He’s not on of those people who still hate Lucas too, is he? 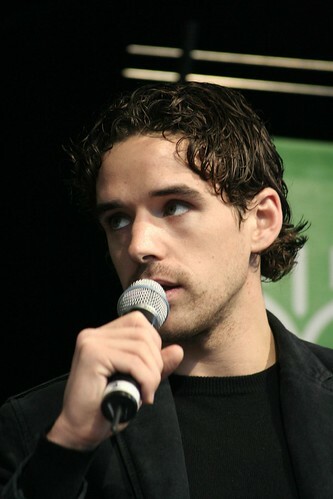 Owen Hargreaves was a great player. After years of not playing it is kind of a gamble. I hope his body won’t fall to pieces and he has two or three years on the field. With his experience (good and bad) he might become a good manager. Yeah, at the very least I hope he manages a short run of games. Horrible to see him keep returning only to have to get fit again. Did you just write this so to use that picture of Owen Hargreaves, Karaoke Extraordinaire?